Abijan (Cote d’Ivoire) – March 22, 2017 (travelindex.com) – The Africa Tourism Monitor Magazine just issued with emphasis on Sustainable Tourism through innovation, entrepreneurship, and technology carries a message from Alain St.Ange, the former Seychelles Minister for Tourism, Civil Aviation, Ports and Marine alongside the messages of a number of African Ministers. 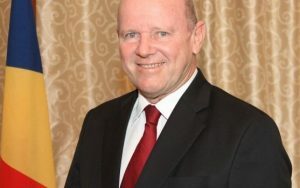 The message from Alain St.Ange (now a candidate for the position of Secretary General of the UNWTO) states: “Seychelles is part of the small developing island states and one that depends entirely on tourism. Our tourism industry, and the tourism industry of Africa, needs consolidation and this will be achieved when Africa works with Africa and only when Africa gets to know Africa. After the consolidation, we need to accelerate the growth of our industry and this is by embracing entrepreneurship and technology. We are a continent of capable and innovative people and we need to now open more doors for our people by claiming back our industry through encouraging Africans, in its diversity, to get more involved”. “His messages are consistent, they are level, they praise Africa for wants Africa to work with Africa” said a journalist in seeing this Africa Tourism Monitor Magazine. In 2014, arrivals in Africa increased overall by 200,000 over the previous year. Arrivals in Egypt rebounded in 2014 with a 5% increase, equating to 454,000 more visitors than the prior year. Morocco maintained its record of surpassing 10 million arrivals for the second consecutive year. Additionally, Côte d’Ivoire shows promise with a 24% increase in arrivals, which means 91,000 more visitors than in 2013. The African Development Bank recognizes, however, that it is not enough simply to sustain these growth levels, commendable though they are. What is equally important is sustained research and data generation to create the necessary knowledge base for effective decision making, policy formulation, and implementation in support of tourism, and hence economic growth and development. In this respect the Bank will sustain its pivotal role in collecting, managing, and disseminating tourism data alongside a plethora of other conti- nent-wide statistics, through its Open Data platform. Africa Tourism Monitor is a joint publication of the African Development Bank (AfDB), the Africa House at New York University (NYU) and the Africa Travel Association (ATA). Africa Tourism Monitor , produced in partnership with New York University Africa House, and the Africa Travel Association (ATA). Tourism continues to be one of the fastest-growing and most dynamic sectors of Africa’s economy. In spite of recent challenges, including the Ebola outbreak in West Africa during 2014, the sector has tremendous potential to create jobs, boost inclusive economic growth across the continent, and reduce poverty.